Dental pain is an abnormal sensation caused by problems involving the teeth. Dental pain can be caused by various reasons, a few of which are decribed below. An exposed tooth neck, for example, can cause dental pain. The transition zone of enamel into cementum (cementoenamel junction) is not always seamless, and sometimes a bit of the inner dentin gets exposed. Normally, however, the cementoenamel junction is well protected by the gingival sulcus. If anatomical deviations lead to dentin exposure at the neck of the tooth as well as exposure of the cementoenamel junction, then cold air and/or hot or cold food may cause the individual to feel pain. How does the cementoenamel junction come to be exposed? By periodontitis, for example, or by tooth movements and/or anatomical peculiarities. Surgical procedures such as wisdom tooth removal may also expose the cementoenamel junction. During wisdom tooth removal, the bone is drilled and the wisdom tooth is eventually levered out. The wound heals but the surgery causes some tissue damage; the gums behind the preceding tooth sink a little, thus exposing the tooth neck and causing pain. A brace can also cause change in the position of the junction in relation to the gums. The use of fluoride-containing toothpastes can give ongoing protection to the exposed dentin; however, if the patient consumes too much of acidic food or beverages or neglects his/her oral hygiene, then this protection can be lost and hot and cold items will once again cause pain. This type of pain is a sharp, shooting pain that disappears when a lot of saliva gathers in the oral cavity. There are many other reasons for pain in the neck region of a tooth. Nevertheless, the dentist can alleviate this pain by sealing the sensitive tooth neck, irrespective of the cause of pain. Another reason for dental pain is exposure of the dental nerve (pulp) by caries, leading to inflammation (pulpitis) and, eventually, death (necrosis). 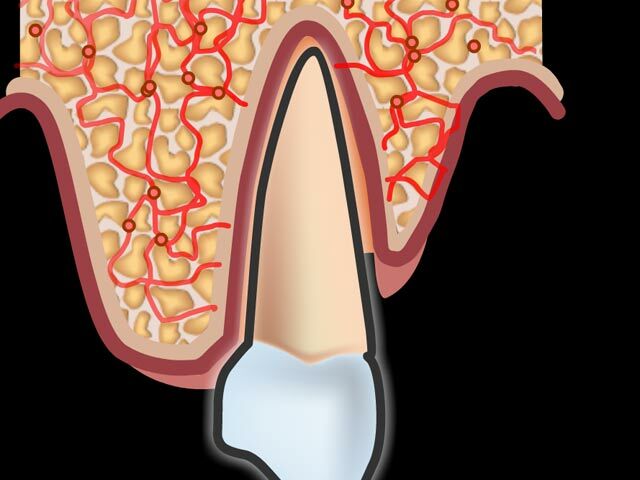 In addition to caries, drilling of a tooth and/or chemicals used by the dentist while restoring a tooth may also cause pulp exposure and necrosis. The patient will feel a dull throbbing pain that may be pretty strong and linger for a few days. As a rule, however, it generally disappears after a few days. If root canal treatment is not performed on time, then the pain may disappears as the pulp necroses completely; however, the focus of infection still remains. The infection then spreads to the bone, the tooth becomes sensitive to tapping (percussion), and it becomes impossible to bite with that tooth. Infection of the bone may take days, weeks, months, or even years to develop. In order to avoid worse complications, it is best to have every painful tooth investigated.